In Bootstrap 4 Forms Tutorial With Example, you will learn how to create elegant forms with Bootstrap. Bootstrap 4 uses the standard HTML5 form elements to add the variety of elements within a form. You can create responsive and consistently styled forms using Bootstrap 4 form classes. A couple of classes are new in Bootstrap 4. HTML forms are an integral part of the web pages and applications. Bootstrap 4 provides the default style that is applied across most form controls. It also provides classes for the specific purpose. Form controls automatically receive some global styling with Bootstrap. All textual <input>, <textarea> and <select> elements with class .form-control have a width of 100%. The stacked layout type is a default type for Bootstrap forms. Forms can include different types of elements like text input, password, multiple select, textarea, file upload, checkbox, radio buttons and submit button. Each element is grouped inside a <div> with .form-group class. The example of a Bootstrap form will look like below screenshot. Inline forms are created by applying a .form-inline class to the <form> element. In an inline form, all of the elements are left-aligned and inline. The other thing is that should be noted that these class only works when the screen width is above 576px. If a screen is smaller, the input fields will display in the stacked layout anyway. The example of a Bootstrap inline form will look like below screenshot. 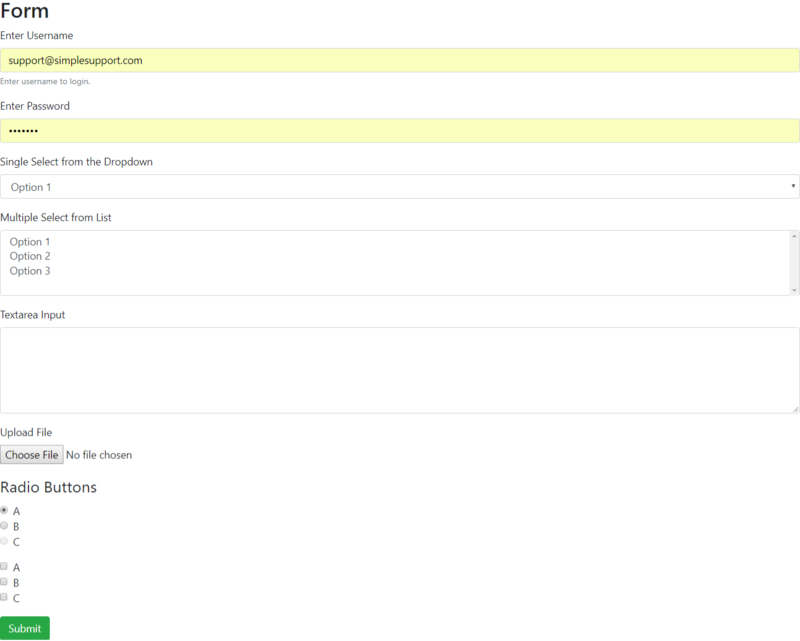 The inline form above feels compressed and will look much better with Bootstrap’s spacing utilities. The following example adds the right margin (.mr-sm-2) to each input on all devices (small and up). A margin bottom class .mb-2 is used to style the input field when it breaks. The example of a Bootstrap inline form with utilities will look like below screenshot. At last, our Bootstrap 4 Forms Tutorial With Example is over.